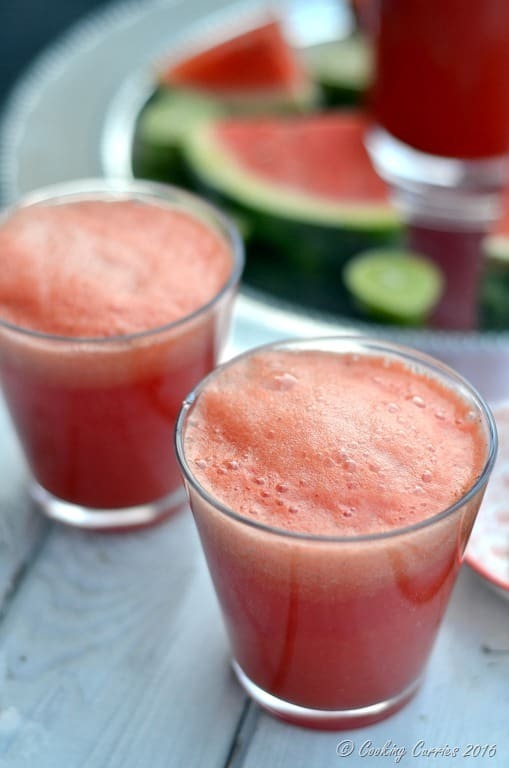 Ginger, lime and chat masala come together with watermelon and topped with soda to this most amazingly refreshing Watermelon Ginger Masala Lime Soda that will soon become your staple summer drink. On a hot Indian summer day, after playing out in the sun, the only thing we would want as kids was a lime soda. It was basically limeade, made with sugar and salt and some club soda added to it. Only soda in those days came in a green glass bottle, that was pressure closed with a marble and was called “goli soda”. You can still see them in some roadside small shops in India. As we got older, we were allowed to have the regular soda or what we call soft drinks, but I never really took to it that much. I could never finish a bottle of coke or pepsi. The only thing I liked was Mountain Dew or Fanta. Now, that I think of it, eek!!! Amma and Appa never really liked these new soft drinks that were there and always pushed us kids to drink fresh juices instead. But, of course, we were kids, teenagers and did not care about healthy, good for you stuff. Somehow after a little while, we really got hooked on to fresh fruit juices. There was this corner juice shop in the main shopping are of the town we lived in. Our Saturday ritual as a family was to first stop at the juice shop and have a glass of fresh juice. Mine and Amma’s favorite was the carrot ginger juice. We would then head over to the library while crossing the vegetable market on the way, pick out a few books, walk back to the vegetable market and buy vegetables for the week. Then we would stop at the little cart right after a rail crossing, where the vendor would be making fresh tapioca (cassava) and potato chips. You could buy them just salted or spiced with chillie powder. We would pick up a couple of packets and head back home. My brother and I would devour our tapioca chips while reading the books we picked out at the library. It was such a simple, predictable yet comfortable life and we loved it and waited for those Saturday evenings. After moving from that little town in Kerala in a few years, I completely forgot about my favorite carrot ginger juice. It was years later, after I was married and when my husband and I went on a vacation to Jamaica, that I suddenly revisited those old memories of ginger in juice. We stayed a small family owned resort, where they had a farm from where they picked fresh fruits and veggies. There was a nice lady who cooked for the family and guests, who would make a different fruit juice every single day we were there and there was always a touch of ginger in it. In the Jamaican heat, it was waters from the heaven touching your lips. 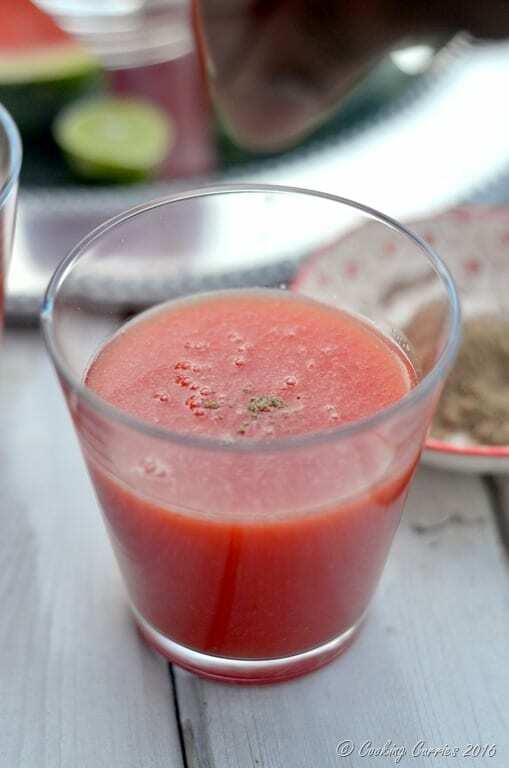 The ginger gave an instant boost of refreshing energy. It was lovely and I longed to get back home to get the ginger-fruit juice in my daily diet. Of course, it did not become a daily affair but now I remember it and try to put ginger in my fruit juices whenever I can and wherever it will taste good and I just have to share that little secret with you all. 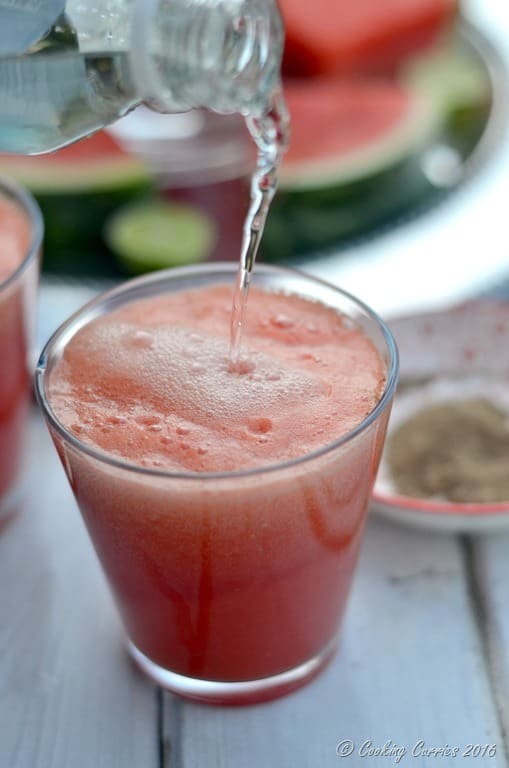 This Watermelon Ginger Masala Lime Soda has watermelon and ginger blended together with some ice, which you can just serve as it is. Or you can add some chat masala to it. Mix it well. You can easily find chat masala at any Indian store near you. And top with some club soda, just before serving, to make it the most refreshing drink you can have this summer. 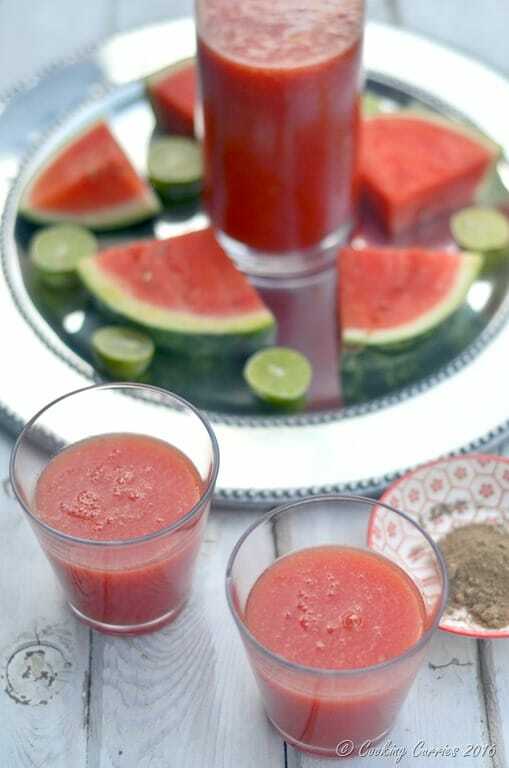 Blend together watermelon, ginger and crushed ice. Keep chilled in the refrigerator, if you are serving later. Ideally you should blend it all in just before serving. 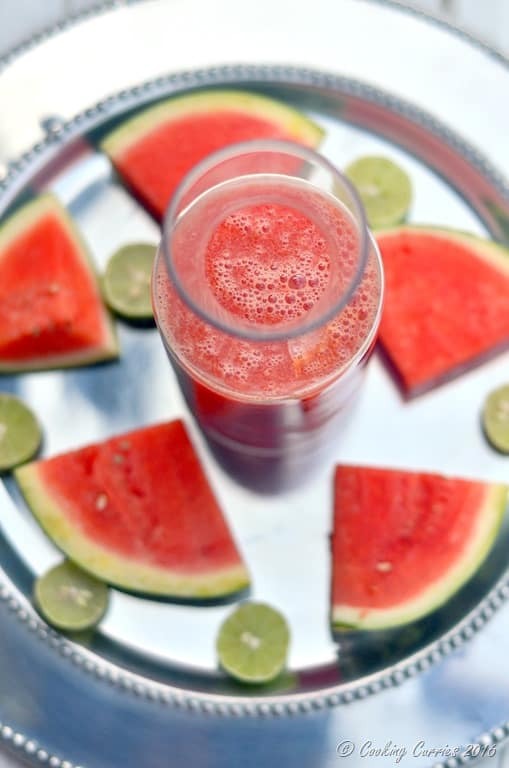 While serving, pour out about half a glass of the watermelon, ginger, ice blend. Sprinkle about half a teaspoon of chat masala on top. Mix it in. Top with a little club soda and serve immediately. O that sounds so super refreshing for summer!! Delicious flavor combo! Oh my gosh, this looks and sounds out of this world!! Wow, this sounds amazing! Part of me wonders how it would be over ice with some gin! Don’t wonder anymore! It would be awesome and I think you should make some ? Love the addition of masala, sounds like a great detox smoothie! Looks like such a unique and refreshing drink for a hot summer’s day! What a lovely flavour combination and so refreshing. it looks great! 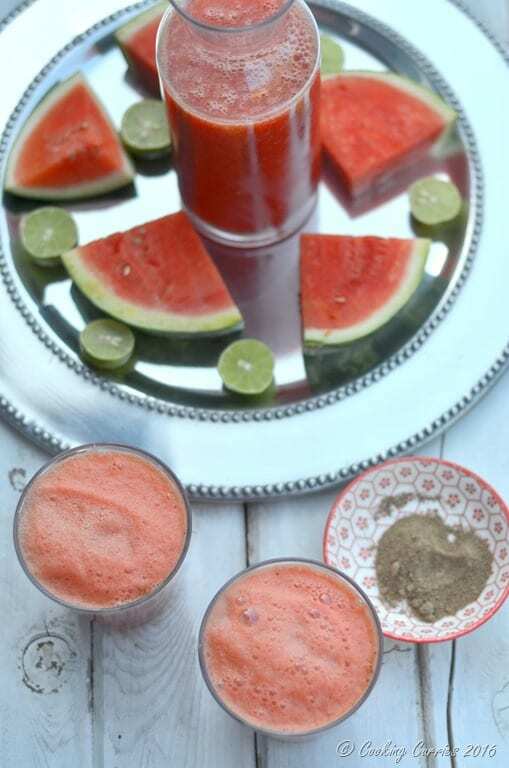 I typically have never been a huge fan of masala powders in fresh fruit drinks, probably because that’s all my parents served growing up haha! 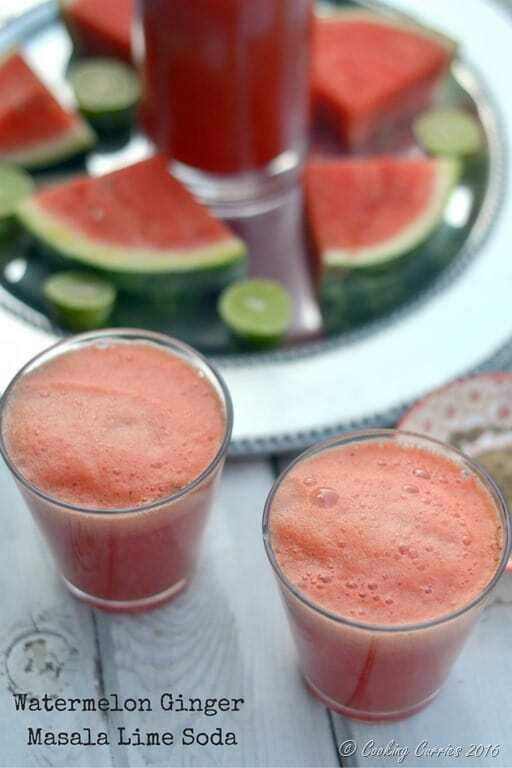 =) But I’ve never tried it with watermelon, I’m intrigued…need to try it out! Haha! I know how that works! Hope you try this out! Haha! I know how that works! Hope you try this and love it! ? This lemonade looks excellent, ginger + lime is the bomb! Ginger + lime! Yes! It is da bomb!